Movies and dreams have always been closely linked. Cinema history is full of movies of dreams, from the films of Georges Méliès and the 1911 cartoon of Little Nemo in Slumberland to the world of Freddy Kreuger and Nightmare on Elm Street. 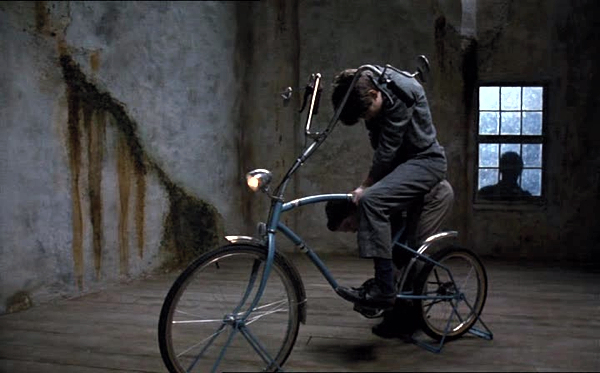 There are two basic approaches – adding dreams inside films as part of the plot, or giving the entire movie the structure and imagery of a dream. 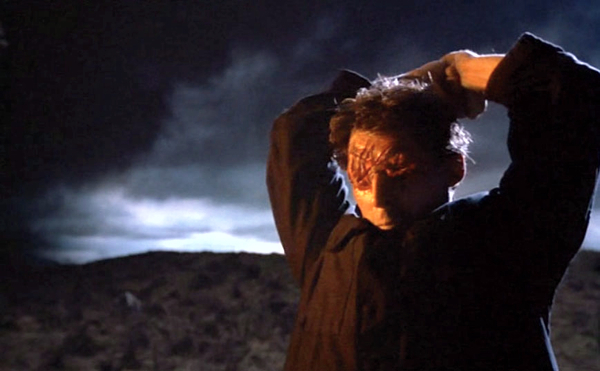 Hitchcock’s Spellbound belongs to the former category, where the solution to the mystery hinges around the interpretation of Gregory Peck’s dream, as designed by Salvador Dali. On the other hand the short animation Destino, another Dali-inspired movie started as a collaboration with Disney in 1946 but only completed in 2003, is a dream from start to finish. Other examples of dream-obsessed Surrealists turning to cinema to realise their visions include the classic Un Chien Andalou (1928) , and Jean Cocteau’s Blood of a Poet (1930). Dreams can be ineffably creepy, especially because we are largely passive witnesses to images and ideas bubbling up from the dark places of the soul, with little control over their jump cuts and bizarre shifts of perspective. Three films stand out for me as truly unnerving nightmares transferred to the big screen, Eraserhead (1977), Phantasm (1979) and Paperhouse (1988). The film is based on the 1958 children’s novel Marianne Dreams by Catherine Storr, a typical middle-class kid’s book redolent of long summer afternoons, ginger beer, tuck and beastly Latin prep. Having found a magic pencil in her great grandmother’s workbox the eponymous heroine draws a house, which subsequently appears in her dreams. Every time she changes the picture the enhancements also turn up in her increasingly sinister visions. The film takes the story, uproots it from its winsome Arthur Ransome world and drops it into anxiety-ridden Thatcherite Britain. The heroine, now Anna, lives with her disinterested mother in an expensive London flat while her father swans off elsewhere on expensive business trips. Resentful of his absence, Anna is a difficult child who tells lies and bunks off school to hide in derelict stations with her friend. Having drawn a house in class she faints as she succumbs to glandular fever and finds herself on a lonely moor standing in front of her house. As the illness takes hold and she is confined to bed she revisits the scary world of the house and discovers it has an inhabitant, Marc, who can’t walk. The OMG moment comes when Anna’s doctor reveals that she’s also tending a boy called Marc who is not only paralysed but is also dying. From then on, like a scary version of Fawlty Towers, every single thing Anna does to save the situation only makes it ten times worse. In a fit of logic only a fever-addled teenager could produce she decides to add Dad to the picture, wielding a hammer. Deciding she’s made him look bonkers she scribbles his face out. In the book menacing rocks called THEM sporting big eyeballs close in on the house for no particular reason. They are positively cosy compared to the hammer wielding blind maniac who turns up to chase Anna and Marc round the Paperhouse bellowing ‘Do you know me?’ as he finally attempts to beat Anna flat on a landscape riven by chasms of lava. This is because by now Anna’s managed to set fire to the drawing of the house in the real world, along with her bedroom. To be honest, not only is Anna stubborn and awkward but she can’t draw for toffee. At that age my daughter was churning out endless pictures of Sailor Moon and Pocahontas, both of whom would have been far more use than mentally deranged Freudian dad. 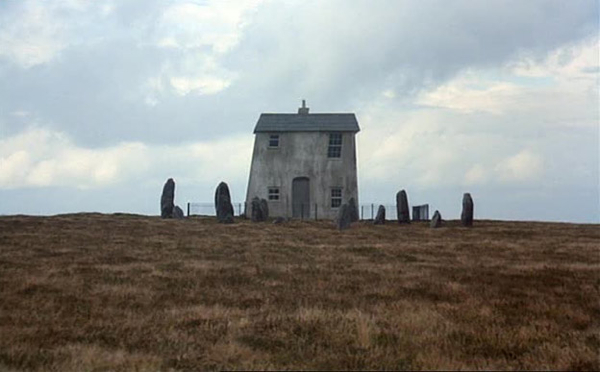 Visually the film is a stylised treat – completely dominated by the freaky child-designed house – all brooding lopsided windows on the outside and empty spaces filled with purposeless machines inside. The film peters out towards the end when an all-together too realistic lighthouse replaces the wonky Paperhouse as a refuge against the encroaching horrors and the film tails off into a slightly unconvincing encounter with forces beyond mortal ken on the edge of a seaside cliff. 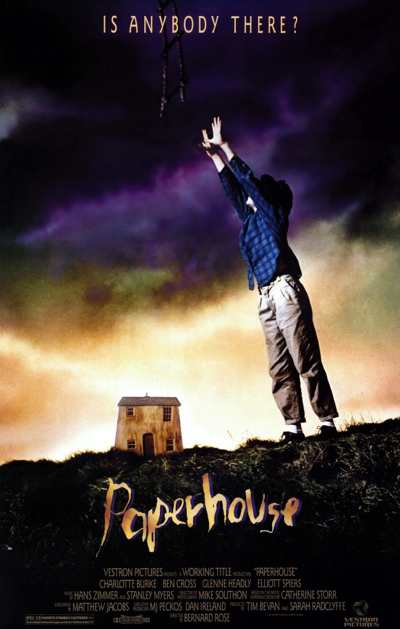 Paperhouse is an unsung classic that transposes a cosy tail of school chums defeating evil à la Susan Cooper’s Dark is Rising series to the altogether grim and alienating world of late 1980s London where harassed, absent or disinterested adults leave their kids to confront nightmare fears by themselves. The overwhelming sense at the end of the movie is that grownups are, on the whole, untrustworthy or generally useless and on no account should you let them into your dreams. At just over a fiver it’s well worth a watch and I won’t deny that the beginning of the movie gave me the inspiration for parts of Thumb. However, I’m convinced that Stephen King was influenced by ‘Marianne Dreams’ when he wrote about Patrick Danville and the Crimson King in ‘The Dark Tower’ Vol. VII.